Since President Trump's tweet on OPEC landed just as we were sending out Generate yesterday, I'd like to revisit the topic ... I discussed the topic with some experts who said his tweet is timed to message the cartel to boost their production and to divert attention from a Democratic offensive on pump prices. ICYMI, here's the president's take on oil markets: "Oil prices are too high, OPEC is at it again. Not good!" It follows an April 20 tweet when he accused the cartel of "artificially high" prices. Why it matters now: The tweet comes ahead of next week's critical OPEC meeting in Vienna, where oil ministers will discuss their production-cutting agreement with Russia. The U.S. isn't the only country putting pressure on OPEC — Bloomberg reports that China and India are discussing ways to boost imports of U.S. crude and lessen those from OPEC "to put pressure on OPEC producers to keep prices under control." "I suspect that with Brent three dollars higher than his first tweet on April 20, average retail pump prices within whiskers of $3, and given recent pushback from Iran on increasing supply, President Trump wants to keep the pressure up on Riyadh to swat oil prices back this summer by signaling and delivering more barrels next week in Vienna." "My reading of it is that with summer here and gasoline prices still relatively high President Trump is looking to shift the blame from government and 'big oil' companies to everyone's favorite villain — OPEC." "It also has the added benefit of taking the narrative on gas prices back from the Democrats," adds Wald, referring to how Democrats have recently been attacking Trump over pump prices. My thought bubble: Given the strong signals that OPEC and Russia will agree to higher output next week, it's possible that Trump's comment is a Twitter-age example of an age-old Washington tactic — taking political credit for something that's going to happen anyway. An ally has doubts: Sen. James Inhofe (R-Okla.) warned embattled EPA Administrator Scott Pruitt Wednesday that he may have to resign citing mounting ethics scandals, Axios' Khorri Atkinson reports. What's happening: Speaking on Wednesday in a radio interview with conservative pundit Laura Ingraham, who herself has called for Pruitt to step down, Inhofe said the administrator "has really done some things that surprised me." An option for him to fix things, Inhofe said, "would be for him to leave that job." Yes, but: A spokesperson for Inhofe told Axios the senator was not calling for Pruitt's resignation, but that he has concerns about the reported allegations and wants to hear about them from Pruitt. After the radio interview, Inhofe spoke to the Post about Pruitt, and said he's seeking a meeting with the administrator no later than Monday. New call to step down: The editors at conservative magazine National Review on Wednesday urged embattled Pruitt to resign, citing his "bizarre" and "venal" behavior, amid a slew of ethics controversies surrounding his spending and management decisions at the agency. OPEC and soccer: per Bloomberg, "Russian President Vladimir Putin and Saudi Crown Prince Mohammed bin Salman will discuss how to boost oil production while maintaining their petro-alliance when they meet in Moscow on Thursday to watch the soccer World Cup’s opening match between the two countries." Possible futures: In a note this morning, Barclays' analyst Michael Cohen says he expects an agreement to raise output at next week's meeting. But that said, he floats another possibility. "If OPEC concludes that even higher prices are needed to restart the investment cycle and that the macro economy would experience little headwind from $90/b or $100/b oil, it may not change the current cuts," he writes. Cohen notes that "we disagree with each of these conclusions," but adds that public statements from officials in the OPEC/non-OPEC group suggest divisions. Sanctions and trade: via S&P Global Platts, "China, Iran's top oil consumer, will likely attempt to evade sanctions that the US has promised to reimpose in November, but ongoing trade disputes and sensitive diplomatic talks could motivate Beijing into limited compliance." One interesting possibility: "[A] former State Department official said that China would not cooperate with reimposed sanctions unless they got a 'big concession' from the Trump administration, likely within the brewing US-China trade war." Why it matters: there's a lot of uncertainty around whether the reimposition of sanctions will remove a significant amount of Iranian barrels from the market, given the absence of multilateral support that accompanied Obama-era penalties that helped bring Iran to the table for nuclear talks. Venezuela: A Reuters exclusive says Venezuela — despite having one of the world's largest crude reserves — is considering using foreign oil to produce fuels to meet its contractual obligations. State-run oil company PDVSA may process up to 57,000 barrels per day of foreign crude in June at the country’s largest refinery, the report said. "PDVSA has been falling short on fuel exports in recent years due to a lack of lighter crudes to refine, a shortage of spare parts, poor maintenance, and management upheaval at its domestic refining network. PDVSA also lost access in May to inventories produced in Curacao, where it operates the Isla refinery," per Reuters. Axios' Henrietta Reily writes ... Increased use of electric space and hot water heating can steeply cut carbon emissions from U.S. homes and buildings, a major source of greenhouse gases (GHG), a new analysis from the nonprofit Rocky Mountain Institute concludes. Why it matters: The report underscores how achieving extremely steep emissions cuts in the coming decades will require far more than just increased use of low-carbon power generation sources. Big picture: Even a wholly carbon-free power system would only cut U.S. emissions by 30%, RMI notes. This is far from enough for the 14 states with official plans to cut emissions by 75% or more by 2050. But, electrification could play a key role in closing that gap. Go deeper: Read the full post in the Axios stream. Screenshot of climate finance growth levels from the "Joint Report on Multilateral Development Banks’ Climate Finance," released by the World Bank Group. Rising: Financing from big multilateral development banks (MDBs) to help developing and emerging economies cut emissions and adapt to global warming rose in 2017 to $35.2 billion, according to a new report released via the World Bank. You can read the whole report (and decode all those bank name acronyms in that chart, sorry) by clicking here. Over three quarters of the money went to mitigation, that is, various initiatives to curb GHGs, while the balance was for projects to help countries deal with effects of climate change like heavy precipitation. 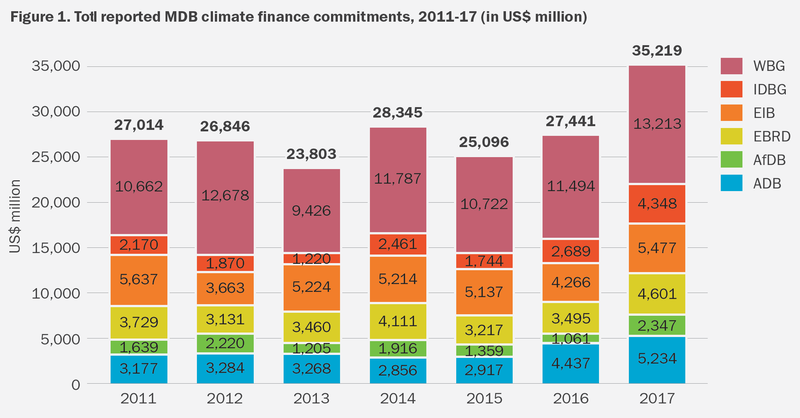 One level deeper: A World Bank summary notes that the MBD money is just part of the global finance picture: "[T]he same adaptation and mitigation projects attracted an additional $51.7 billion from other sources of financing last year." According to the report, almost $30 billion of that was from other public sources, while nearly $22 billion was private capital. The big picture: Andrew Light of the World Resources Institute called the data "unambiguously good news." "One of the most important things that needs to happen is to convert MDB funding to climate-smart streams rather than fueling the problem. This has been a long time coming and it’s clearly accelerating," he said in an email. The BP analysis also shows that global coal consumption ticked up slightly for the first time in four years, fueled by increases in India and, to a lesser extent, China. Click here to learn why in the Axios stream. Axios' Amy Harder reports ... Top executives from nearly three dozen mostly manufacturing companies are urging Trump to back a policy achieved under former President Obama that they say would create American jobs. It would also cut GHG emissions, but that went unmentioned in their new letter. Why it matters: This is a classic example of how an industry works to ensure it benefits from regulations. These companies are poised to make a profit as consumers buy new appliances, like air conditioners, with new, climate-friendly refrigerants. To them, it isn’t really about climate change. Timing: The letter, sent Wednesday and obtained by Axios, comes just a few days after a group of 13 Republican senators sent a similar plea. The details: The policy at issue is an amendment to a global environmental treaty, the Montreal Protocol, that phases down refrigerants in appliances that emit powerful GHG emissions. The amendment was signed in Kigali, Rwanda, in October 2016, with leadership by Obama and his then-EPA Administrator Gina McCarthy. The executives, like the senators in the earlier letter, are urging Trump to send the amendment over to the Senate, which needs to review it and ultimately vote on approving it in order for it to go into effect. Not approving the amendment “could transfer the current competitive advantage from America to other countries, like China,” wrote the executives, which includes Honeywell, Johnson Controls and Dow Chemical. As in, 5.4 million barrels per day of oil production. That's how much oil the consultancy IHS Markit projects will be coming from the booming Permian Basin in 2023. Background: The region, which spans a wide part of Texas and part of New Mexico, is the epicenter of the shale boom. Oil production in the Permian last month was around 3.2 mbd, according to federal data. Why it matters: It signals that the group sees room for a huge output expansion at a time when some others have raised concerns about declining productivity of new development and other problems. By the numbers: The consultancy, which includes prominent oil analyst Dan Yergin, projects $308 billion in investment and almost 41,000 new wells between 2018 and 2023. Their analysis assumes a WTI oil price of $60 per barrel or higher. They see "decelerating production growth in the early 2020s due to high capital investment requirements and an assumption of little productivity improvement." Factoid: 5.4 mbd is more output than any OPEC member except Saudi Arabia, IHS notes. Go deeper: Jim Burkhard, IHS VP of research, explains the analysis here.